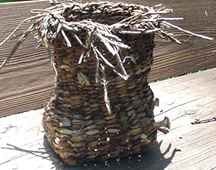 Many, many thanks to the Basket Bunch for showing us how free we can be with gathered materials! We could not wait to try these techniques, and the first vines we saw was English Ivy in the yard. It was easy to manipulate, and easy to gather. Lynn cautions that some people are sensitive to this plant, however, and may react to it. We did not have any problems. These are our first attempts at random weaves. That is Lynn's on the left, with the lovely, arching handle...Pamela's on the right. 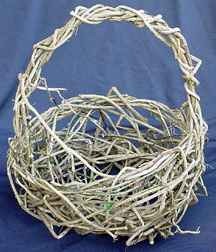 Also wanting to emulate Persis' neat cornucopia baskets, Pamela attempted a small wicker weave...but it turned out to be a wall basket, which was just fine. The green is from very fresh runners which have not dried yet. The little tendrils are roots which were left on the runners. We also attempted to gather Kudzu, and found that it needs to be gathered in the fall. It dies all the way to the ground in winter, and though the skeleton structures left will rehydrate, they were not ready in the late spring/early summer. Too snappy. What we cut, we peeled, and plan on using the bark. 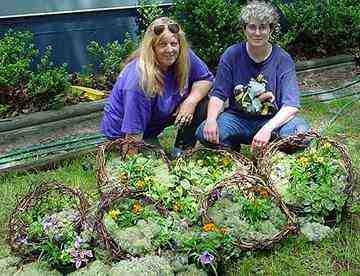 Here is a basket Pamela made of kudzu bark twined with iris leaves. Pamela really wanted to try a large wicker basket, so she gathered anything she could find that appeared to be the right size. 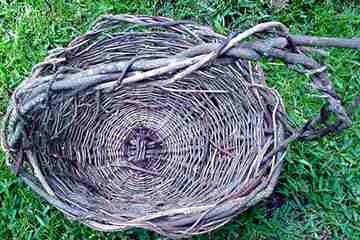 The stakes on this basket are Carolina Jasmine, Grapevine, Wisteria, and various tree roots not identified. 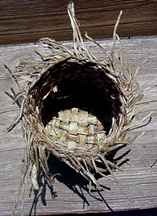 The first weaver is Carolina Jasmine, the rest are wisteria and grapevine. 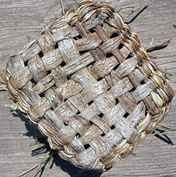 When finished weaving the sides, all the extra stakes were just too beautiful to cut off. 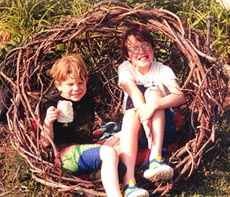 So they were woven randomly back into the body of the basket. The result is about 3 feet tall, and about 2 feet across. 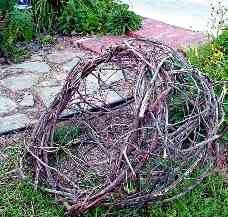 After that, Pamela tried some fine honeysuckle, and had a great time making small, garden-type baskets. We found a bunch of grapevine, wisteria, and honeysuckle, and started weaving random weaves...these were christened "pods" in no time by Lynn...the largest, on the left, required both of us to start - from very thick, long grapevine. After it started to take shape, Lynn wove the rest alone, and finished it out. It now sits in her garden, and the result is large enough for an adult (or a large dog, or two kids, take your pick!) to fit inside. Really great. After weaving a bunch of these, Lynn helped me to fill them with moss and plants, and they were given to my children's teachers as end of year gifts. I must say, they were well-received! We ended up making 13 in all, I think. Thanks, Lynn! 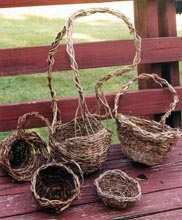 More basketry and gourds by Lynn Hoyt can be seen at Coiled Gourds and Baskets. Or in her Pine Needle Group Gallery. More basketry and gourds by Pamela Zimmerman can be seen at Natural Baskets by Pamela Zimmerman. Or in her Pine Needle Group Gallery.